I used to read quite a lot of urban fantasy but these days generally confine myself to several favorites. Among them are Jane Yellowrock by Faith Hunter, the Magic series by Ilona Andrews, anything by the immensely talented Jim Butcher, Anne Bishop's Others and the Mercy Thompson series by Patricia Briggs. All the series mentioned have a common factor I think; believable and relatable characters and situations, despite the inherent nature of books about supernatural characters. Mercy Thompson is a "walker", a Native American shape changer who takes the form of a coyote. She is also the mate to Adam Hauptman, the alpha of a werewolf pack in Washington state and a Volkswagon mechanic with a propensity to attract trouble of all kinds. It has been quite a journey for Mercy, brought up in a werewolf pack in Montana. Always an outsider in the pack, she has learned to be fiercely independent but has friends who are vampires and fae, as well as human. The trouble in Fire Touched starts with a troll on a bridge, not one of your internet trolls but a huge, destructive, human-eating troll. The werewolves are "out" to the public, as are the fae, and the police call for assistance. Both werewolves and police are losing the battle until Zee and Tad, two close fae friends arrive with a boy who appears to be about 10 years-old. The boy, Aidan, is actually hundreds of years old. He was lost in faerie "underhill" and emerged with the ability to command fire. His abilities help destroy the troll. The "Gray Lords" want him back, but Adam and Mercy promise him sanctuary. Keeping him safe will be a tall order. Mercy continues to evolve, growing and changing, but keeping her core of loyalty and commitment to doing what is right for all concerned. She is clearly stepping into the role of second in command in the pack. There are plenty of the usual supernatural politics and action in Fire Touched but this book is a little more focused on relationships than some of its' predecessors. I highly recommend the Mercy Thompson series but starting at the beginning is imperative with the first novel, Moon Called. I also recommend the audio versions narrated by Lorelei King who has become Mercy's voice for me. 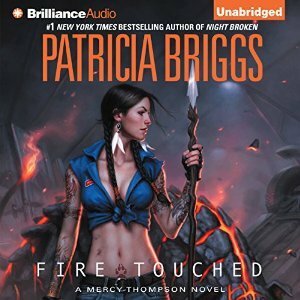 I do have to make a comment on the covers of both audio and print versions, though; Mercy has only one small tattoo of a wolf's paw and would never wear a skimpy top to a fight or anywhere else. She is a jeans and t-shirt girl. I know the covers need to stand out but a little more truth in advertising would be welcome.